Multicultural marketing is the promotion of a brand to one or more targeted multicultural groups, or to an ethnically diverse consumer base, through a lens of cultural values, attitudes, ancestry, communication preferences and lifestyles. Why do we need Multicultural Marketing? The latest Census data shows the increased growth and spending powers of the multicultural markets. Moving forward, companies will need to implement new strategies for increasing revenue and brand loyalty utilizing these growing segments of the population. 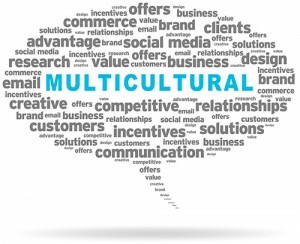 Why Invest in Multicultural Marketing? The growth among major multicultural categories is four times that of non-multicultural groups, illustrating the growing diversity in America. Key multicultural marketing groups include African Americans, Latinos and Asian Americans. Contact Us to learn how you would benefit from our Multicultural Marketing Services.